> Max > What’s happening Monday?? Had a pretty uneventful weekend as P had to work for most of it. So really Saturday and Sunday were like any other weekday, except I went grocery shopping and did the laundry (woo). For Saturday night’s dinner we went out for our friends birthday. The tradition is to go to a Chinese food restaurant (not buffet styles though). Oh man was the food good! We each order our own apps, but whatever entree you ordered was shared amongst the group. We ordered 4 orders of General Tso’s Chicken, which you would think is one too many. It wasn’t. We ate it all. There was surprisingly very little left over! 2) Robotics Tournament! On Wednesday we head to Oshawa for the annual FIRST Robotics competition. Max is all set up with safety earmuffs and sunglasses (can’t find infant safety glasses, I guess because normally when do babies operate heavy machinery? It is a requirement that when you are in the pits (where the teams work on their robots) that you wear safety glasses. 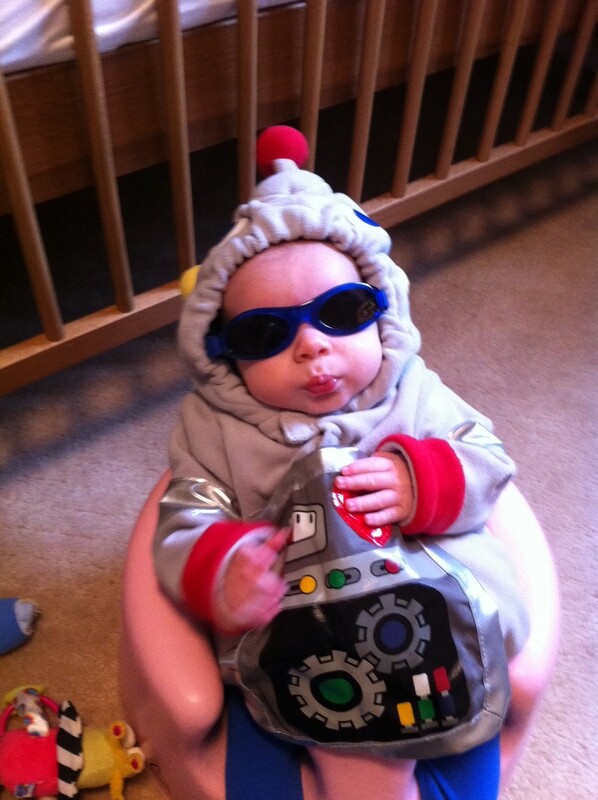 Max also has a robot costume. 3) Max is going in the crib when we get back from Oshawa. I think it is a good time to transition him there. He is big enough that I don’t feed him during the night anymore (actually, he doesn’t want to be fed) and big enough that he is starting to roll around in the bassinet. We are going to start this upcoming weekend since P is on March break, meaning that if we have a bad night we just sleep in a bit. HOWEVER, it is a time change weekend and we lose an hour. So Max’s normal 11pm-ish bedtime will actually be at midnight. I am going to move his bedtime up 15 minutes at a time starting tonight so that hopefully I can avoid problems. 4) I will be starting my running training program this weekend. P should be home a bit more often so it will make it easier. I am doing the 10K training program that is kind of like couch to 10K idea. I am just racing to finish, not worrying about the time. Since I haven’t ran since August, this will probably hurt a bit, so we are starting slow. 5) iPad 3 release is this week. I will NOT be getting this iPad as there is nothing wrong with the iPad I have now. Rumour is this one will have a retina screen which will make the iPad look really really pretty. I do notice the difference between my iPhone and iPad in terms of screen quality. But for what I use my iPad for, it doesn’t matter right now. Plus my actual goal is to get an iMac when the school promotion starts (you usually get a free gift card or something if you are a student or teacher, and I am both). I have a Macbook and it is now 4 years old. So many people have problems with their Macbooks during year 5, so I am saving now before there are any surprises. Plus, I am almost 100% certain that Apple will not let me upgrade to OS Mountain Lion. I had to upgrade my memory to get Lion. I am getting an iMac this time, because I don’t bring my laptop anywhere thanks to the iPad. Plus, I won’t be getting rid of the Macbook (as long as it still works), so it will still be around. Finally….Optimus Prime is trending? The other day Sheldon Cooper was trending….how do these things start?